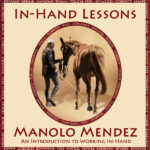 Learning to work in-hand and lunge correctly without guidance is not as easy as buying a book or a DVD which is why our DVD comes with a very active Facebook Study Group in which we offer a 24-page manual, feedback, videos, articles and comments. Here are some sample questions from our group members who ride in over 30 disciplines around the world and include amateurs but also trainers, veterinarians, farriers, trimmers, bodyworkers and more. ANSWER: Young ones starting out with in-hand work will often do this as they are unbalanced and find it easier to go on their dominant side. Until you get very comfortable with your handling of the lunge line and your bamboo or lunging whip and are able to predict when he is about to change direction, if he automatically changes direction of his own accord, stop and turn him back to the side you had him. Start again on the side he finds more challenging but give him more rests and walks. Don’t drill and insist. It will set him up to resist and it will/ can create a problem for future in-hand work as he may learn to get away from you or resent the work. Another way Manolo addresses this stage of the horse’s development is by lunging him/her in the corner so the horse has the support of two walls to guide him instead of “free floating” in the middle of the arena. Try not to have the lunge line too tight or too slack. This is like having too much contact on the reins or too little. If the horse becomes hard against your hand give a slight tug towards you as if to bring him in on a closer circle and when you feel him soften, very quickly release your tug. Give, take, give take – BUT do not pull hard and release hard because then you will throw the horse off balance. 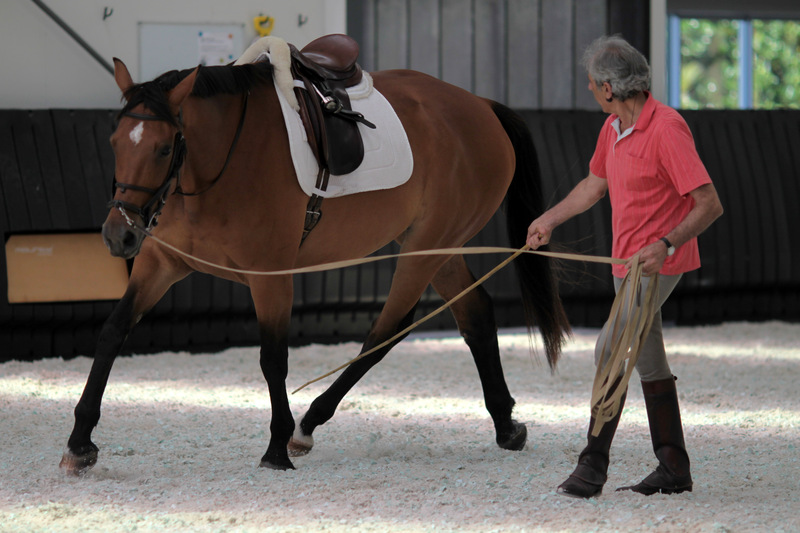 If you keep the horse on a ‘short/tight’ contact with the lunge line all the time – he will get very heavy in the hand, just like a bitted and bridled horse becomes when the rider’s hands are not soft and giving. Learning the finer nuances of in-hand is an art form and having the right amount of contact is an expression of this artistry. Developing your feel for the right contact in-hand will teach you much about contact when you are riding, for what you get on the lunge line is what you will get under saddle. Remember that it takes months to develop balance, to develop straightness so when your horse is falling in or out it is not because “it likes to” or “wants to” but because its body symmetry at this moment in time leads to that un-balance and crookedness. So what can you do? If there is an issue at the gate and the horse wants to get out the horse is telling you it does not want to be in the arena with you, working. It is your job to make the arena a desirable place and work something the horse wants to do. So what can you do? You can modulate the situation to fit your training without purposefully looking for conflict and anticipate and drive a little more before you know he will stop – and then work somewhere else so the temptation is not there to get out. – What is his right rhythm, when he is breathing well? ANSWER: That is really a very individual thing, because physical as well as mental fitness come into play. Ten minutes is for a fit horse and it does not mean you should keep the horse in either trot or canter or walk non stop for 10 minutes, it means you can do work in different gaits, give a little walk break or a break but avoid changing direction during that time so the body can properly warm up. When we say do not give too many breaks, it is because we have had students who are giving the horse halt breaks almost every circle which is excessive. You have to become an expert on who your horse is because no one is every going to know this horse better then you since you spend your time with him and can observe him in every aspects of his life. So you know if your horse is bold or timid, if he works out of nervous energy, if he is naturally low energy or is a horse that finds working easy and you can compose with this. You can tell if your horse had a good night or not by looking at his paddock or stall and his expression. Does he look bright eyed and cheery or dull and a bit lethargic. – Some days you just walk around, give a pat and are done. – when your horse cannot do something, you do not assume it is because it is being purposefully disobedient and think about how to introduce the work differently or shelve it until next time when the horse is maybe stronger and more balanced. Those are all good questions because they go to the root of what it is a trainer needs to know in order to work well with a variety of horses. We are encouraged to treat all horses the same, but in fact we do much better with them when we recognize that just like dogs and people, each horse is an individual and when we figure out who they are, teaching them becomes much easier. ANSWER: This is a great question and goes to who your horse is, how much training he has had and how fit, supple, even and balanced he is. If your horse is working for you in one direction for a while and then starts to tell you he wants to stop or change direction he is essentially telling you that he is no longer comfortable so what you want to do ideally is to anticipate when you horse is likely to need a change of direction or more importantly a change of LINE. If your horse is telling you no more circle, then go on a straight line or an oval or make the circle much larger but change the horse’s alignment and the demands on its body. If your horse is constantly trying to stop and change directions and you know because your vet has seen him that he has no physical issues, you may be dealing with a horse that needs to learn how to work. Just like a child going into kindergarden, does not know how to stay sitting for long periods or how to write and read, the young horse does not know what his job is and so you have to teach him in a way that does not turn him off the work. There is a big difference between a horse that is testing a handler and a horse that is testing the situation in order to understand what it is supposed to do. Manolo works horses quite energetically and he is firm but he is also very very patient and he always gives the horse the benefit of the doubt so that a horse would have to demonstrate bad faith clearly after Manolo offers solutions for him to say ‘ok mister, you are going to give me one more circle” the minute the horse softens and gives, Manolo praises, gets a few more good steps and then gives a break. You can purchase the DVD by clicking here. Or purchase a streaming version you can download by clicking here. 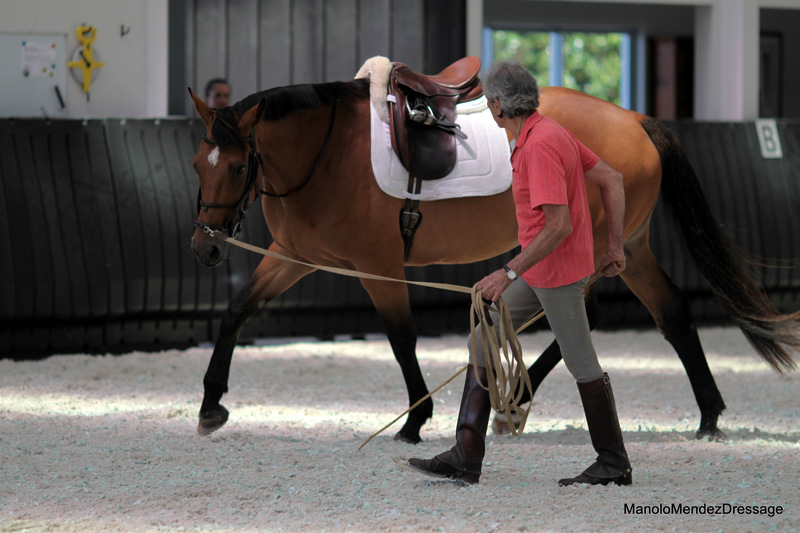 You can learn more about Manolo’s training approach by browsing articles here.